The mainstays of obesity management are simple and well known to health professionals: reduce sugar and saturated fat intake, eat more fresh vegetables and whole grain fibre and increase physical activity. The complexity lies in the psychosocial, cultural and economic barriers that people need to overcome in order to sustain the lifestyle changes required to achieve long-term weight-loss. “Fad” diets, myths and misinformation about weight-loss, and the difficulties of discussing obesity with patients, add to this challenge. Patients who do manage to lose weight should be followed-up regularly in primary care to encourage them to maintain their lifestyle changes. Currently no anti-obesity medicines are funded in New Zealand and there is a very limited role for their use in obesity management, although several new medicines have recently been licensed overseas. Bariatric surgery is the most effective and sustainable weight-loss treatment for select patients who are morbidly obese. PART 2: What is a healthy diet? The clinical significance of obesity cannot be overstated; along with increasing age it is the largest contributor to long-term morbidity in developed countries.1 In New Zealand, one in three people (31%) are now obese (i.e. have a body mass index [BMI] ≥ 30 kg/m2 ), and the prevalence appears to be increasing year-by-year.2 Halting this epidemic requires wide-ranging social, economic and political change. However, people who are already obese require interventions and ongoing support from primary care. A healthy dietary pattern and regular physical activity are the two cornerstones of obesity management. Patient engagement is critical in reversing weight-gain through behavioural change. It is therefore important not to offend patients when discussing obesity; the terms overweight or excess weight may be preferred by some patients. More than two out of three (68%) Pacific adults and almost half (48%) of Māori adults were reported to be obese in 2012/13.2 Of particular concern is the early age of onset of obesity in these groups. More than one in four (27%) Pacific children and almost one in five (19%) Māori children are obese.2 As obesity becomes more prevalent there is the danger that it is becoming accepted as the new norm in society. This means that some parents may not recognise that their children’s health is being adversely affected by their weight. * Healthy people with a high amount of muscle mass, e.g. athletes, may be classified as obese using BMI cut-offs. For further information see: “Addressing weight issues in young people and families in New Zealand”, BPJ 45 (Aug, 2012). People will often experience weight loss when they begin a new dietary pattern as they are paying more attention to what they eat, eat less overall, and often exercise more. However, most diets are not successful long-term as body weight is regulated by complex homeostatic neural and endocrine processes that guard against weight loss, but do not protect against weight gain.1 It is therefore generally easier for people to gain weight than to lose it. It is reported that approximately 80% of people who intentionally achieve weight loss of ≥ 10% regain that weight within one year.7 This means that people who diet frequently often end up in a cycle of unintentional weight gain, followed by intentional weight loss and then unintentional weight gain; this is referred to as weight cycling.7 Patients who have developed excessive guilt and feel “hopeless” about previous patterns of unintentional weight-gain may benefit from a brief explanation of weight cycling. Continued contact with a health professional increases the likelihood that patients will be able to maintain weight-loss over the long term. How much weight loss is recommended? Which type of diet is best? The cornerstones of good dietary advice remain much the same as they have for years: reduce sugars and saturated fat, while increasing whole grain cereals and fibre. There is no difference in the weight-loss efficacy of diets with different macronutrient compositions, e.g. low carbohydrate diets or low fat diets (although there are adverse nutritional outcomes associated with some of these diets).9 This means that a person will lose weight on any diet that they are able to stick with, as long as energy consumption is less than energy expenditure. Therefore, the best health advice for people is that they eat a balanced and nutritious, calorie-reduced diet. What is new in dietary advice? Diets with energy intake levels outside of these ranges, e.g. low carbohydrate diets, increase the risk of inadequate micronutrient intake, especially if people avoid fruit.3 However, for people who are obese and who also have diabetes, a diet that contains a relatively low intake of energy from carbohydrates, but still within the recommended energy intake range, may be preferable.11 Slowly digestible carbohydrates, e.g. whole grain bread, lentils, legumes and nuts, are ideal sources of carbohydrates for these people. “Going against the grain” is a commentary by University of Otago health researchers on low carbohydrate-high fat diets, published in the Lancet in October, 2014 (Volume 384, Issue 9953). Which foods should people enjoy daily? Foods containing saturated fat, foods with added salt or added sugar and alcohol should be considered discretionary and their intake limited, by all people, and especially by those who are attempting to lose weight.3 Consuming these foods regularly is associated with obesity, cardiovascular disease, some cancers, type 2 diabetes and other long-term conditions. High-fat foods containing butter, cream, cooking margarine, coconut and palm oil should be replaced with foods containing predominantly polyunsaturated and monounsaturated fats, such as oils, spreads, nuts and avocado.3 Foods containing high levels of trans fat, e.g. cakes and cookies, potato and corn chips, and fried food, should be avoided due to the association between trans fat and heart disease. Consumption of drinks containing sugar such as sugar-sweetened soft drinks, cordials, fruit juices, vitamin waters and energy and sports drinks should be limited. Vegetables contain specific nutrients associated with health benefits, e.g. potassium and magnesium decrease blood pressure. High fibre in vegetables positively influences cholesterol levels. The antioxidant properties of vitamins found in vegetables, e.g. C and E, reduce inflammation, haemostasis and atherosclerotic plaque formation. Increased consumption of a variety of vegetables reduces energy intake and increases water consumption. It is probable that each additional daily serve of vegetables is associated with a reduced risk of coronary heart disease and stroke. Individual studies report a reduced risk of dementia associated with a high vegetable intake. Vitamin and minerals present have specific mechanisms of benefit and phytochemicals, e.g. carotenoids and bioflavonoids, have antioxidant properties which reduce the risk of cardiovascular disease. Consumption of fruit is associated with a reduced risk of weight gain, coronary heart disease and stroke. Individual studies report a reduced risk of dementia associated with a high intake of fruit. Eat at least four to six serves of grain foods per day. Choose mostly wholegrain breads, cereals, e.g. oats, and brown rice over less nutritious white rice, white bread, pasta and noodles. Health benefits are partially provided by complex carbohydrates resistant to digestion in the small intestine which may be protective to the colon. Dietary fibre, B group vitamins, vitamin E, iron, zinc, magnesium and phosphorus are also present in grain foods depending on the source and the degree to which they are commercially processed, e.g. oats contain β-glucan which binds to bile salts causing the liver to increase breakdown of cholesterol, whereas wheat does not. In general, wholegrains contain more nutrients and phytochemicals in the bran and germ parts than refined grains where the bran and germ have been removed. Wholegrain and/or high cereal foods are associated with a reduced risk of weight gain, cardiovascular disease and type 2 diabetes. Lean meats, poultry, fish, eggs and plant-based alternatives such as tofu, beans, nuts and seeds. Processed and cured meats may have high levels of saturated fat and added salt therefore are not included in this group. They should only be eaten occasionally and in small volumes. This is a very broad food group and the health benefits vary depending on the food. Generally, an important source of protein, as well as iodine, iron, zinc and other minerals and essential fatty acids. Eating nuts and seeds reduces heart disease and is not associated with weight gain if total energy is controlled. Eating fish more than once a week is associated with a reduced risk of stroke, cardiovascular disease and dementia in older adults. Red meat should be eaten in moderation as consumption in quantities greater than 100–120 g per day is associated with an increased risk of colorectal cancer. This group also includes calcium-enriched soy, rice and oat drinks. Choose mostly reduced fat options. Other dairy foods such as butter, cream and ice cream are not included in this group and should only be eaten occasionally and in small quantities. Calcium in these foods is highly absorbable and may be preferable to calcium supplements. Calcium may reduce cardiovascular risk by affecting vascular endothelial function. Protein, iodine, vitamin A, vitamin D, riboflavin, vitamin B12, zinc and other bioactive substances present in milk products may also provide health benefits. Consumption of milk, yoghurt or cheese is associated with improved bone density and a reduced risk of ischemic heart disease, myocardial infarction and stroke. Low fat dairy food is associated with reduced risk of hypertension. It is probable that more than one serve per day of these foods, especially milk, is associated with a reduced risk of colon cancer. Motivational interviewing is one technique that health professionals can use to encourage patients who are obese to exercise. Part of this approach involves expressing empathy and acknowledging that issues such as self-perception of body shape are potential barriers to participation in exercise for some people. A number of studies have reported that people who are obese find it especially difficult to exercise in the company of experienced gym members.16 In particular, females who are obese are reported to experience more social anxiety about their physique than normal-weight females.16 Strategies may need to be devised to overcome these barriers. One simple suggestion is to encourage people who are overweight to exercise together.16 General practices can facilitate networking amongst patients who would like to exercise with others. Alternatively, walking groups can also be found via social media or enquiring with the local DHB or PHO. Self-efficacy, i.e. the extent to which a person believes in their ability to achieve goals, is an important determinant of success when people first begin to exercise.16 Self-efficacy is known to be highly situational and one person may have high self-efficacy for one activity, e.g. weight training, but a low self- efficacy for another, e.g. aerobics.16 Patients can be encouraged to engage in exercise that they are confident they can succeed at. However, if a person has a lot of previous experience with an activity then their technique will be efficient and they will use less energy when performing this task.17 Therefore it is important that people also attempt activities that they are not familiar with. Patients can be encouraged to replace sedentary activity with physical activity that is either productive or that they are interested in. For example, establishing a vegetable garden will involve exercise as well as providing an inexpensive source of food for the family/whānau. If people are required to perform sedentary tasks for long periods at work then a standing desk or walking during lunchtime are two strategies for increasing energy expenditure. Weight-bearing exercise is more effective at reducing BMI than non-weight-bearing exercise, i.e. where the body is supported against gravity. 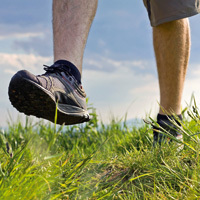 For example, walking or jogging uses up to 30% more energy than swimming or cycling for the same period of time.17 Encouraging patients to think of ways they can walk more is a good entry point for discussions about weight-bearing exercise. For example, parking further away from the supermarket entrance or getting off the bus one stop early. Encourage patients to extend their exercise goals as they notice their fitness improving as this will increase energy expenditure. For example, a patient may begin with walking to the shops for a daily paper, then using the stairs at work, before attempting light jogging once their fitness is sufficient. Appropriate footwear should be worn by people who are walking or running for any distance, particularly people with diabetes. Exercise such as resistance training should begin with easily manageable resistance and slowly increase as strength and fitness improve. When setting goals with patients who want to lose weight it is important that there is an emphasis on improving cardiovascular fitness, as well as losing weight. People who improve their cardiovascular fitness, even with little or no change in BMI, show improvements in blood pressure, glucose metabolism and blood lipid profiles.18 Some people may find this information provides added motivation to their exercise programmes. It may be helpful to also explain to patients that performing resistance-based activities, e.g. many gym-based exercises, may increase their muscle mass and therefore weight-loss may be less than expected. Goal-setting and self-monitoring increases the likelihood that behaviour change will be maintained.16 Daily physical activity can be monitored by the use of a pedometer which can then be recorded in a diary or graphed. Software applications for mobile phones are also available that map the distance a person covers when they are walking. Fitness trackers can be worn on the wrist and record movement and sleep patterns, as well as providing analysis of the information that is collected through a mobile phone application, e.g. correlations between sleep patterns and activity levels during the day. People who have social support for exercise are more likely to maintain levels of increased physical activity and to achieve long-term weight loss.16 This may take the form of group walking or team sports. Regular contact with a health professional increases the likelihood that patients will be able to maintain a healthy lifestyle following weight loss. This contact may be as brief as a five to ten minute meeting every two weeks at a weigh-in, and other than being supportive and enthusiastic, no specific training is required by the health professional. A New Zealand study recruited 200 females aged 25 – 70 years who had intentionally lost at least 5% of their initial body weight in the previous six months.19 Following a consultation with a nutritionist, when they were given educational material about healthy eating, and a meeting with an exercise consultant, patients were randomised to either a simple nurse-led support programme or an intensive programme led by a dietician and exercise consultant. Over a two-year period both weight maintenance programmes were found to be equally effective and in many cases patients were able to further reduce their weight, waist circumference and amount of body fat.19 Many participants in this study reported that an important reason for its success was the regular weigh-ins and support offered by the nurse.19 This psychosocial component of treatment may explain why support groups such “Weight Watchers” or “Jenny Craig” report anecdotal success in supporting weight loss. It is recommended that all people, regardless of their weight, do at least 30 minutes of moderate exercise on most days of the week. Moderate exercise can be described to patients as, “breathing a bit harder, but able to hold a conversation.” Patients who are motivated to gain additional benefits can extend the amount of time that they are active for or increase the intensity of the activity. The recommended thirty minutes a day of physical activity can be achieved in smaller portions, e.g. ten minute bursts. The objective of the pharmacological treatment of obesity, like diet and exercise, is to decrease the amount of energy that is consumed and/or to increase the amount of energy that is expended. However, many patients prescribed anti-obesity medicines have limited success in achieving clinically significant and sustained weight loss, without a substantial and ongoing commitment to lifestyle changes. In New Zealand the only medicines approved for use as anti-obesity agents are unsubsidised. Metformin is associated with clinically significant weight-loss in patients with type 2 diabetes and is fully-subsidised as an anti-diabetic medicine, however, it is not approved for use as an anti-obesity medicine. 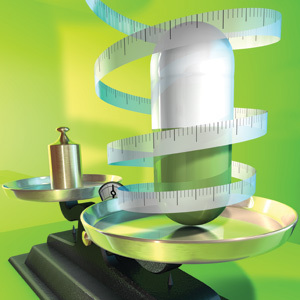 What defines a weight loss medicine? Phentermine can be prescribed at 15 – 30 mg, once daily, in the morning.22 Patients should be advised to contact a health professional immediately if they experience symptoms such as breathlessness, chest pain, fainting, swelling in the lower limbs, or a decreased ability to exercise.22 Prescribers are recommended to consider withdrawing treatment of phentermine at 12 weeks if the patient has lost less than 5% of their pre-treatment bodyweight.22 Treatment beyond 12 weeks with phentermine may be considered for patients who are continuing to lose weight,25 if they are able to be monitored for signs of dependence. Due to the pharmacological similarities between phentermine and amphetamine there is considerable concern that phentermine has addiction potential. Patients who are prescribed phentermine should be regularly monitored to ensure they are taking the medicine appropriately and have not developed signs of aberrant behaviour. It may be helpful to establish a treatment agreement with patients before phentermine is initiated, so that the patient has clear expectations about the goals and end-points of treatment. It is recommended that general practitioners document the patient’s previous attempts at weight loss before considering prescribing phentermine. For further information on metformin dosing and adverse effects refer to the New Zealand Formulary. GLP-1 (glucagon-like peptide 1) agonists are medicines which mimic endogenous incretins that are secreted from the gut following a meal as part of the satiety cascade. GLP-1 agonists act by increasing the secretion of insulin and decreasing glucagon secretion. International guidelines recommend that the GLP-1 agonist exenatide should only be continued in patients with type 2 diabetes who have experienced reductions in HbA1c and at least a 3% reduction in initial bodyweight after six months use.27 At doses higher than that used for the treatment of diabetes, weight loss of up to 10 kg has been reported in trials lasting for two years.23 GLP-1 treatment is associated with several adverse effects, including a possible increased risk of acute pancreatitis and pancreatic tumours. For further information see: “Improving glycaemic control in people with type 2 diabetes: Expanding the primary care toolbox”, BPJ 53 (Jun, 2013). Adjustable gastric banding, which creates a narrowing near the gastro-oesophageal junction restricting the amount of solid food consumed and resulting in earlier satiety. This procedure is associated with the lowest risk of nutritional deficiency. Roux-en-Y gastric bypass (RYGB) involves stapling part of the stomach to create a pouch and then dividing and attaching the jejunum to this pouch. This procedure has a higher complication rate than other procedures. Monitoring of nutrition status should be done twice in the first year following sleeve gastrectomy and RYGB, and once following adjustable gastric banding, then annually for each.14 Adjustable gastric banding requires the band to be adjusted periodically, while sleeve gastrectomy and RYGB do not require specific follow up. Thank you to Professor Jim Mann, Professor in Human Nutrition and Medicine, Dunedin School of Medicine, University of Otago for expert review of this article. Grima M, Dixon JB. Obesity - recommendations for management in general practice and beyond. Aust Fam Physician 2013;42:532–41. Ministry of Health (MoH). New Zealand Health Survey: Annual update of key findings 2012/13. Wellington: MoH 2013. Available from: www.health.govt.nz/publication/new-zealand-health-survey-annual-update-key-findings-2012-13 (Accessed Nov, 2014). National Health and Medical Research Council (NHMRC). Australian Dietary Guidelines. NHMRC, 2013. Available from: www.nhmrc.gov.au (Accessed Nov, 2014). López-Jiménez F, Cortés-Bergoderi M. Update: systemic diseases and the cardiovascular system (i): obesity and the heart. Rev Esp Cardiol 2011;64:140–9. Bjørndal B, Burri L, Staalesen V, et al. Different adipose depots: their role in the development of metabolic syndrome and mitochondrial response to hypolipidemic agents. J Obes 2011;2011:1–15. NHS Choices. What should my daily intake of calories be? NHS, 2014. Available from: www.nhs.uk/chq/pages/1126.aspx?categoryid=51 (Accessed Nov, 2014). Mehta T, Smith DL, Muhammad J, et al. Impact of weight cycling on risk of morbidity and mortality. Obes Rev 2014;11:870–81. National Institute for Health and Care Excellence (NICE). Obesity: Guidance on the prevention, identification, assessment and management of overweight and obesity in adults and children. NICE, 2014. Available from: www.nice.org.uk/guidance/cg43/resources/guidance-obesity-pdf (Accessed Nov, 2014). Johnston BC, Kanters S, Bandayrel K, et al. Comparison of weight loss among named diet programs in overweight and obese adults: a meta-analysis. JAMA 2014;312:923–3. Mann J, McLean R, Skeaff M, et al. Low carbohydrate diets: going against the grain. The Lancet 2014;384:1479–80. Johansson I, Nilsson LM, Stegmayr B, et al. Associations among 25-year trends in diet, cholesterol and BMI from 140,000 observations in men and women in Northern Sweden. Nutr J 2012;11:40. Harvie MN, Pegington M, Mattson MP, et al. The effects of intermittent or continuous energy restriction on weight loss and metabolic disease risk markers: a randomized trial in young overweight women. Int J Obes 2011;35:714–27. Shannon C, Gervasoni A, Williams T. The bariatric surgery patient - nutrition considerations. Aust Fam Physician 2013;42:547–52. Asher R, Burrows T, Collins C. Very low-energy diets for weight loss in adults: a review. Nutr Diet 2013;70:101–12. Hemmingsson E, Page A, Fox K, et al. Influencing adherence to physical activity: behaviour change in obese adults. Scan J Nutr 2001;45:114–9. Egger G, Egger S. Weight management - Facts and fallacies. Aust Fam Physician 2009;38:921–3. Lee S, Kuk JL, Katzmarzyk PT, et al. Cardiorespiratory fitness attenuates metabolic risk independent of abdominal subcutaneous and visceral fat in men. Diabetes Care 2005;28:895–901. Dale KS, McAuley KA, Taylor RW, et al. Determining optimal approaches for weight maintenance: a randomized controlled trial. CMAJ 2009;180:E39–46. Elley CR, Garrett S, Rose SB, et al. Cost-effectiveness of exercise on prescription with telephone support among women in general practice over 2 years. Br J Sports Med 2011;45:1223–9. Ling H, Lenz TL, Burns TL, et al. Reducing the risk of obesity: defining the role of weight loss drugs. Pharmacotherapy 2013;33:1308–21. Rodgers RJ, Tschöp MH, Wilding JPH. Anti-obesity drugs: past, present and future. Dis Model Mech 2012;5:621–6. Rucker D, Padwal R, Li SK, et al. Long term pharmacotherapy for obesity and overweight: updated meta-analysis. BMJ 2007;335:1194–9. iNOVA Pharmaceuticals. New Zealand data sheet: Duromine. 2014. Available from: www.medsafe.govt.nz/profs/datasheet/d/durominecap.pdf (Accessed Nov, 2014). Wilbert B, Mohundro BL, Shaw V, et al. Appetite suppressants as adjuncts for weight loss. Am Fam Physician 2011;83:1–2. National Institute for Health and Clinical Excellence (NICE). Type 2 diabetes: newer agents. NICE, 2009. Available from: www.nice.org.uk/nicemedia/pdf/CG87ShortGuideline.pdf (Accessed Nov, 2014). Nicholas Cooper said: 15/01/2015 8:34:21 a.m. The Editor said: 26/03/2015 9:03:44 a.m.